I’m something of a past master at turning a 2.5-hour trip into a six-hour saga. Thus it should have come as no surprise when I finally reached my accommodation, totally exhausted and still jet-lagged, around 9pm. At the start of the day, it seemed like it wouldn’t be all that bad, but I failed to heed the omens. Lake Apopka, the fourth largest lake in Florida, United States, was on my list and I started out pre-dawn to get a sunrise over the waters. Sadly, ten-tenths cloud cover stopped that in its tracks. That, the fact I’d gotten less than three hours sleep, the lack of wildlife in the anticipated numbers and the fact that Lake Apopka is where all the mosquitoes in the world come from, made my early morning escapade disappointing. I moved on. A long way on. 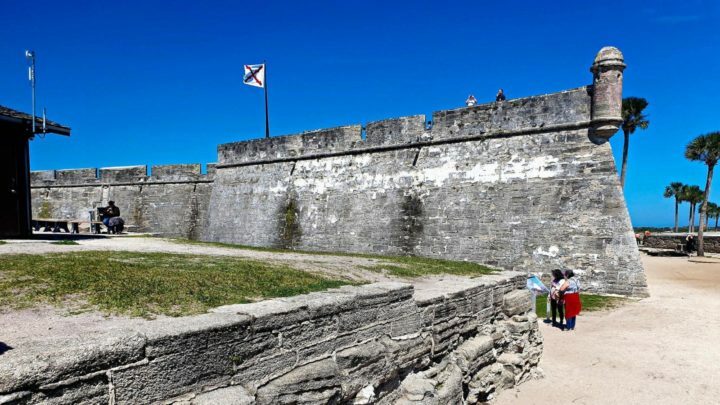 All the way to St. Augustine where I knew there was a fort (Castillo de San Marcos), some art and several historic buildings. En route the GPS on my phone started to falter. Again, it was an omen. However, St. Augustine lived up to expectations. Its only drawback is that, even in the shoulder tourism season, it’s seriously busy. I parked in the ‘Ripley’s Believe it or Not’ carpark on San Marco Avenue because they advertise they are a tourist information centre.Well, I expect they are for some people, but when asked about the art galleries that are supposed to be in the town, all I got from the young staff (four of them) were blank stares. Still, at least I had map now but, before I left, I couldn’t help notice some sculptures in the garden out front. One in particular caught my fancy. Though it’s probably the world’s most recognisable of the genre, I figured there was a story to be had. Indeed, when you went to Florence, Italy and gawked at the statue of David, it’s fair to assume you were unaware it’s only a copy, much like Ghiberti’s almost-as-famous Gates of Paradise just down the road. The originals are kept in an underground vault. For each, two copies were made, one of them in Florence and the others are in America, though thousands of kilometres apart. The Gates are in San Francisco, David is stuck in the sunshine of the east coast at St. Augustine. He, too, is beset by selfie addicts, but I managed to get a couple of shots off in between posers. 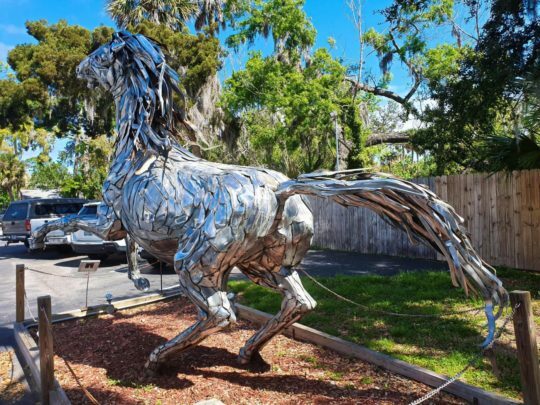 Almost as interesting was the horse sculpture made out of car bumper bars — very original! The fort was only a few blocks away and I could tell it wasn’t a secret. Three laps around the inadequate carpark taught me that. By fort standards it would hardly raise an eyebrow in Europe but here, it’s different. It dates back to 1703 and is of Spanish origin, as is some of the town. It’s a stark reminder of how tricky things could get in the old days when you never knew who might sail up the estuary to remove your belongings. In 15 sieges it was never taken once. Across the way is the historic district, now liberally sprinkled with tourists and kitschy shops to feed their appetites. The narrow alleyways are reminiscent of a bygone era, as is some of the architecture. It was when I decided to leave that the trouble started. I had poor charge in my mobile, but wasn’t worried because I had the charger in the car and thus I set out feeling confident. However, it started to malfunction soon after and, when I pulled into a state park to check it out and maybe have a walk, things deteriorated. Not only was the park closed, I had trouble resetting the phone. Turns out the charger supplied with the phone doesn’t work off the car USB. Not to mind, I had a pretty good idea of the way home. 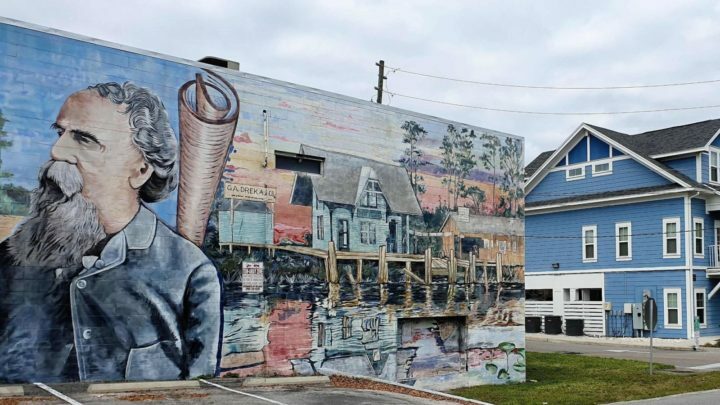 I drove into a town called DeLand, one of a few in the area to have the ‘De’ prefix; something to do with the French I expect but, no, it’s named after the founder of the town. A wealthy man due to his baking soda empire, he bought the area and offered prospective residents a money-back-if-not-satisfied guarantee if they weren’t happy after two years. 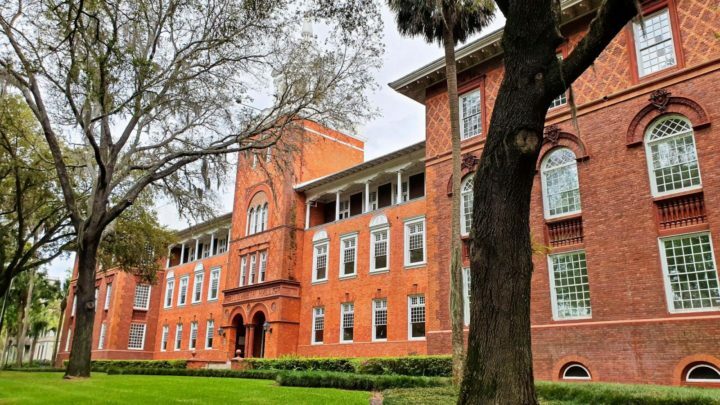 He also established the first college in Florida, later named after John B. Stetson, a wealthy hat manufacturer who bailed it out when money was tight. There was a devastating fire in 1886 and after that all houses were to be constructed of masonry material and there would be no more saloons in the main street because that’s where the fire started. Also in 1886, residents of DeLand were allowed to take 50 cents off their taxes for each oak tree they planted that lived for one year. The residents planted so many trees that the city had to repeal the tax break because there wasn’t enough money collected from taxes to pay the town marshal. Today’s legacy is a picturesque way the envy of every other town in the US. It was an eye opener. As I came in from the outskirts the dazzlingly beautiful architecture of the Stetson University and tree lined streets had me in awe. It was so gorgeous and there, atop a pole, was a banner commemorating the fact that it’s been proclaimed the prettiest main street in the whole US. I hadn’t planned to stop, but how could I not? That pushed me back another hour and I realised it would be dark before I got home. Summing up, I asked five different people the correct route and got three bum steers and two accurate placements over the next three hours. One of the tips was from a homeless man to whom I gave some money at his request. All the time on the way up and back there were tolls. Just going 32 miles (52 kilometres) to the lake in the morning I had to pay four. No wonder they can afford multi-lane roads! It’s certainly taken a toll on me. Do you enjoy self-drive options on your travels? Have you visited Florida, United States?